One of the major benefits of setting up a Project is being able to monitor and track how certain aspects are performing. Each tool has its own way of scheduling email reports and checking progress in the interface. To receive automatic email updates from your Site Audit, check the box at the bottom of the setup widget (1). In addition to the email, you can choose how often (2) you want the website crawled in the last section of the widget. 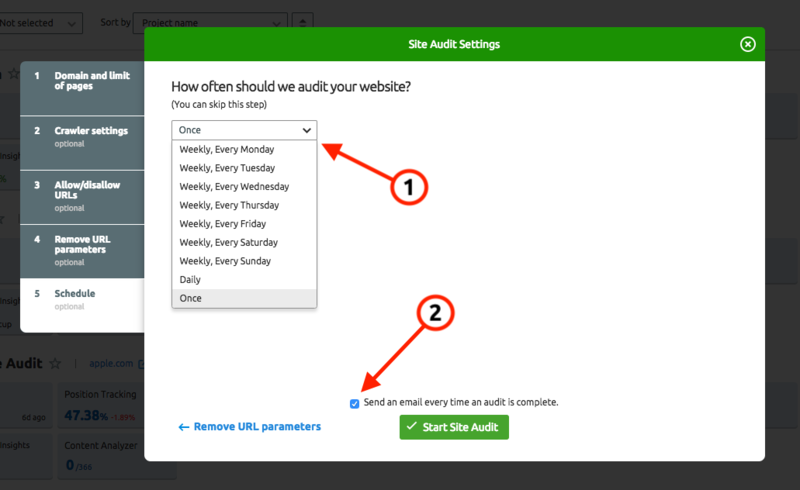 If you forgot to set these up initially you can always change your settings by clicking the gear in the top right of the Site Audit dashboard. Once a Site Audit is run you can use the Progress tab in the tool to see how the domain has performed over a given time frame for your selected issues. 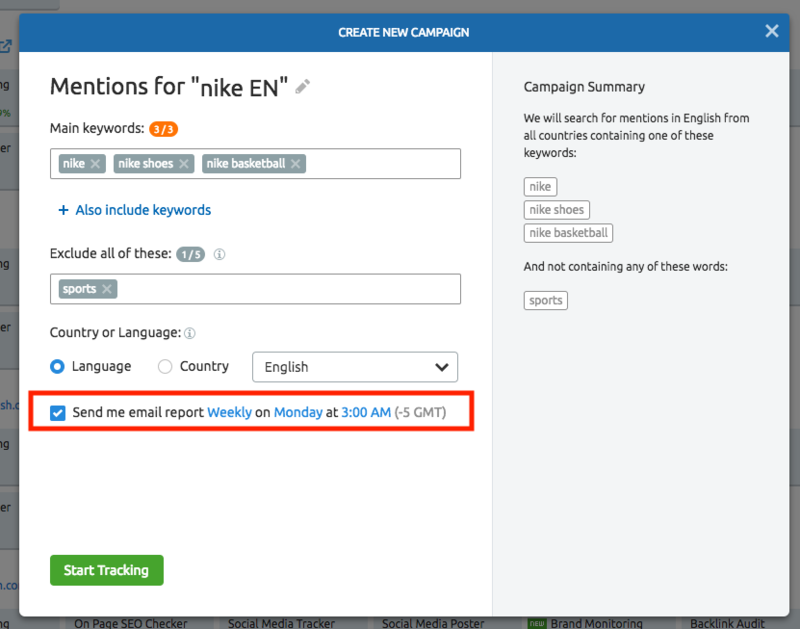 No different than Site Audit, the first way to set up automatic email alerts from Position Tracking is by checking the box in your setup widget. However, unlike Site Audit this box won’t appear until you’re on the last section of the setup stage (keywords). 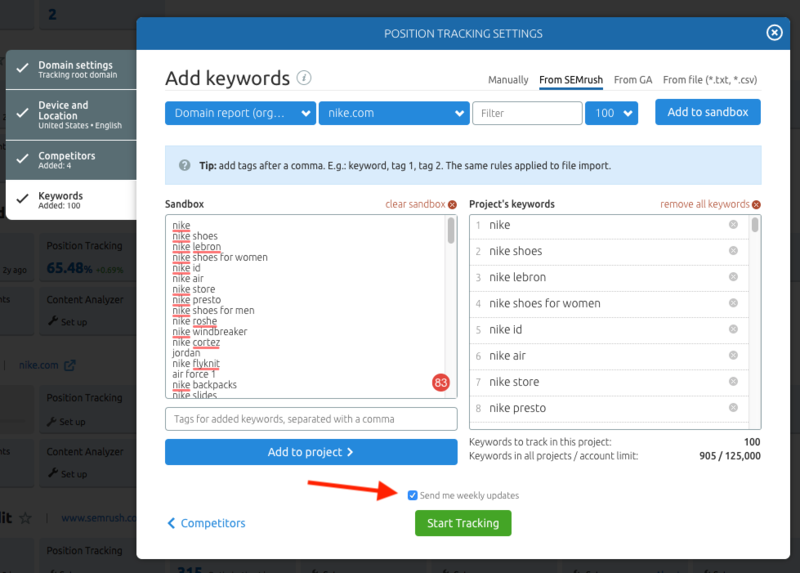 So right before you decide to track your keywords, just make sure to check that box. After this initial setup, you can track your daily progress visually in your Position Tracking Overview report. Check out every way in which you can improve by visiting the Position Tracking Overview manual. On the last step (schedule) of the On Page SEO Checker setup wizard, you can choose to recollect ideas on a weekly basis. 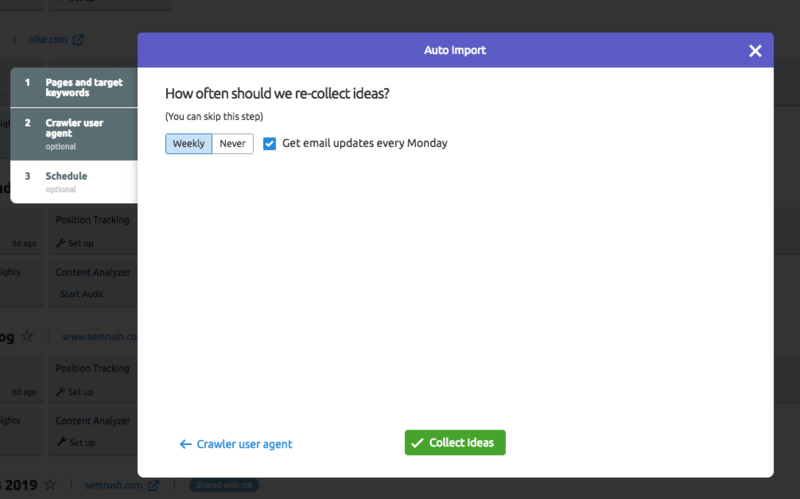 If you choose this, you can also have reports emailed to you weekly with the checkbox. Once you have your campaign running, check out the Idea Tasks tab in this tool to see a visual bar graph of the number of ideas generated each day to track your progress. You can customize the time frame of the graph by adjusting the time frame in the top right of the dashboard. 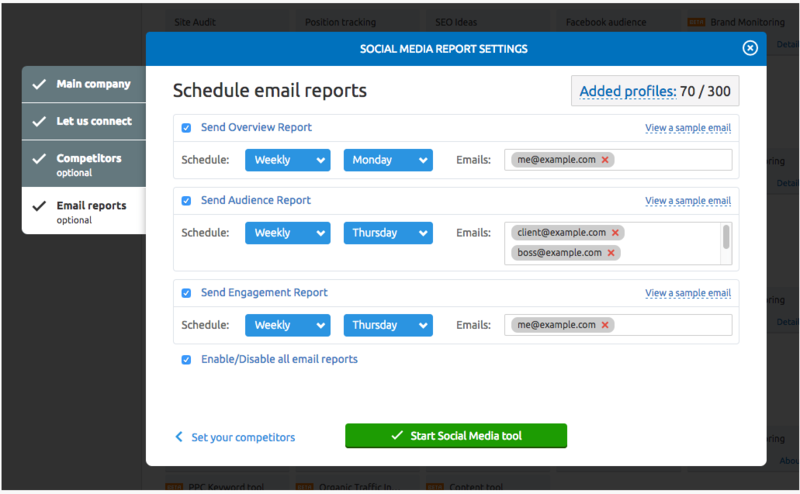 The Social Media Tracker setup wizard has the ability to send multiple reports to multiple emails. You can send Overview, Audience and Engagement reports to up to 10 different emails each. 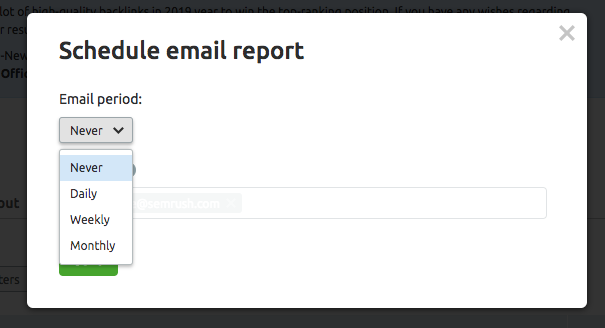 This is all done in the last stage of your setup, conveniently named email reports. You can change these settings at any time using the gear icon in the top right of your Social Media Tracker. 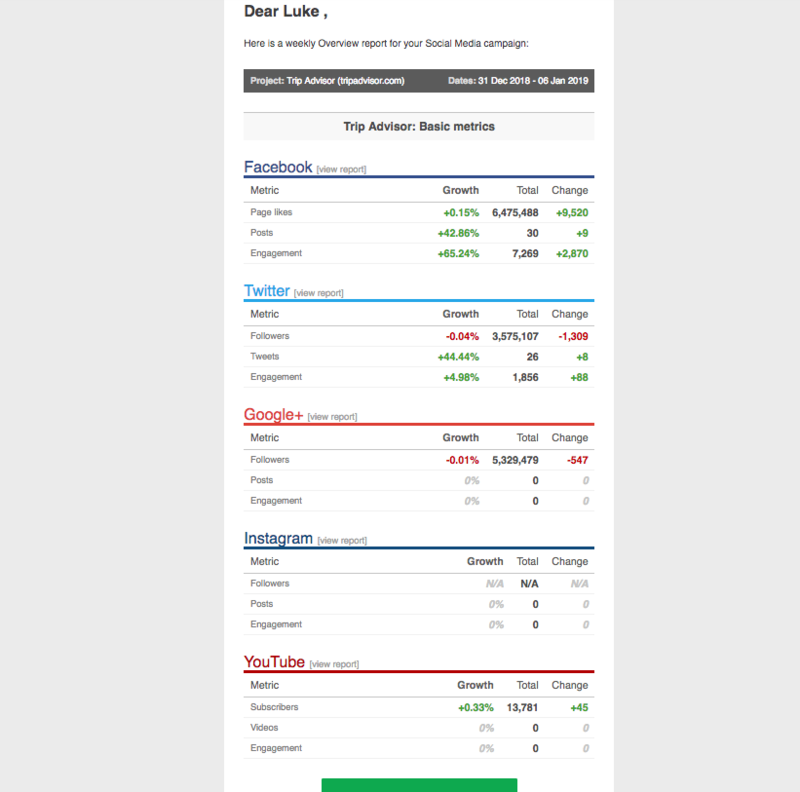 You can see a sample of a Social Media Tracker email below. To adjust the settings of your Social Media Poster to set up email alerts, click on the gear icon in the top right. Here you will have the choice to pick between six different options, in this case, you’ll select notifications. Once selected you can enter in an email address that will notify that person whenever a connection to one of your social media profiles is expired. After hitting the setup button for Brand Monitoring, the “send me email reports” checkbox will be right at the bottom of this setup wizard. Just click that to receive email alerts every Monday. The email you receive each week will present your fresh batch of mentions in a neat list. 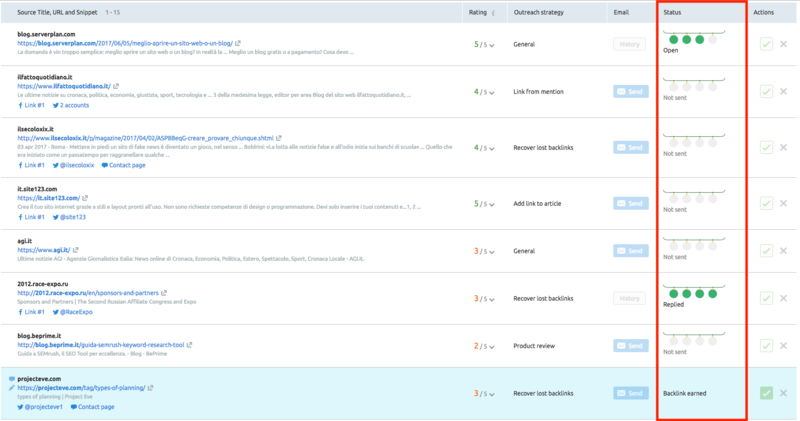 While you are reviewing your mentions in the tool, the Statistics tab will show you a mention volume trend graph for both your mentions and backlinks discovered through the duration of your campaign. After you run an initial setup of Backlink Audit, you may want to reschedule another crawl of the domain. To do this just hit the gear icon, select recrawl schedule and choose between once a week, once in 2 weeks or once a month. You can have Backlink Audit send an email whenever this new crawl is finished. To further monitor your progress, you can use the lost and found report to see how your backlink profile is performing over time. To schedule an email report in Link Building you have to first set up the tool and find the “schedule email report” button at the top right of the dashboard. Here you can enter up to 5 email addresses to receive the report and decide to send alerts daily, weekly or monthly. To track the progress of your link building efforts within the tool, go to the In Progress tab. Here you can see the status of your potential backlinks. Depending on the stage of the outreach process, the status column will show that your email was sent, delivered, read or replied to. Following these steps will ensure that you are always aware of any progress or updates related to these projects. Receiving emails will let you stay on top of any potential negative changes in your projects. If you wish to track all of these projects in one place be sure to check out My Reports.